Could probiotics improve gut health? Do you get cramps in your side after eating certain foods? Do you feel bloated, gassy, or suffer from constipation? If so, then you may have an imbalance in your gut bacteria. Probiotics may be able to help you improve your digestive health. A diverse ecosystem of bacteria in the gut may reduce inflammation in the body. In fact, animal studies show that probiotics could lower levels of inflammation in the body related to such conditions as rheumatoid arthritis and heart disease. However, you should take probiotics on a regular basis for the most health benefit. If taken in a supplement form, try to get a probiotic with multiple strains of bacteria since each strain provides different benefits. Also, those found in a refrigerated form, such as those found in health food stores, may provide a more potent formula. For example, there is a quality probiotic called Biovia 30X made by Vita Sciences. Biovia 30X contains 30 billion colony forming units (CFUs) in 10 different strains of probiotics. Besides probiotics, there are other ways you can help improve your digestive health with just a few tweaks in your healthy lifestyle. Avoid foods that can cause inflammation. Examples of foods to limit in your diet include red meat, high-fat dairy, fried foods, and foods high in additives. Also, processed foods such as sausage and candy that contain advanced glycation end products (AGEs). AGEs should be limited since they can reduce the number of healthy bacteria in the gut. Eat more fiber since it helps to feed the healthy bacteria. Fiber-rich foods include fruits, vegetables, and whole grains such as oats, quinoa, brown and wild rice, and bran, to name a few. Live a balanced lifestyle. Getting enough sleep, staying active, and staying hydrated is important to keep your gut happy. Most adults should get about 7 to 9 hours of sleep each night to help regulate a healthy blood pressure and healthy blood glucose levels. Also, exercise at least 30 minutes a day for most days of the week. This is because studies show that exercise can help enrich the growth of a diverse population of bacteria in the gut. Finally, when you add in more fiber to your diet, drinking enough water each day is important to lower risk of constipation. Aim for about half of your body weight in ounces. If you are 200 pounds, then this means you should drink about 100 ounces, or 12.5 cups of unsweetened fluid each day. Manage stress. Meditation, yoga, relaxation breathing, talking to a counselor, or just finding time each day to relax and do something you enjoy can help lower stress. It is important to manage stress not just to sleep better, but for gut health as well. For example, studies have shown a potential link between the brain and gut health. For example, if you get stressed or depressed, studies show that this could trigger gut health issues. Could more fiber improve your diabetes? Eat your veggies, they say. 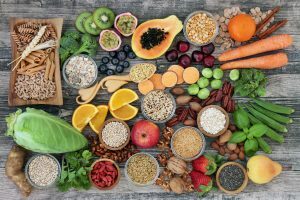 Whether you are trying to lose weight, improve your blood pressure, or just simply trying to live well, you may be told to eat more fiber in your diet. Fiber is not only good for managing weight or keeping your heart healthy though. A recent study has found that more fiber in your diet may actually help improve the health of those with type 2 diabetes. A study in the New England Journal of Medicine showed that people who consumed 50 grams of fiber each day were able to control their blood glucose levels much better than those who ate far less. However, since most Americans only consume on average 15 to 18 grams of fiber each day, this task would be impossible. Therefore, most adults should consume between 20 and 35 grams of fiber each day for optimal health. If you consume between 2 cups of both fruits and vegetables each day, you can easily hit this daily goal. Type 2 diabetes is the type of diabetes that develops when the pancreas makes too little insulin or the body cannot use insulin very well. In turn, people with type 2 diabetes have trouble controlling their blood glucose levels since insulin is a hormone in charge of using glucose for energy in the body. Within the digestive system, certain bacteria are in charge of breaking down carbohydrates in the body. These broken down carbohydrates produce short chain fatty acids that help reduce inflammation in the gut and control appetite. Recent study findings show that a shortage of these amino acids may increase risk of type 2 diabetes. A recent study based in China looked at the effect of a high fiber diet on those with type 2 diabetes. One group of adults with type 2 diabetes were given standard dietary recommendations and patient education. The other group was given a high fiber diet. After 12 weeks, the group of patients on the high fiber diet had had greater reduction in their HgA1C, or three month average of blood glucose levels. In addition, their fasting blood glucose levels and weight dropped more than those not on the high fiber diet. In addition to consuming more fiber, there are several other ways you can help control your diabetes. Know your numbers such as blood glucose levels, HgA1C, blood pressure, and blood cholesterol levels. Keeping track of these numbers will help you see where you stand in terms of heart health and controlling your diabetes. This way, if your numbers are reaching unhealthy levels, then you can take action before complications arise. Stay active for at least 30 minutes a day of moderate activity most days of the week. Moderate activity includes walking, water aerobics, light dancing, and gardening, to name a few. A step counter or fitness tracking device can be helpful to keep track of your movements each day and keep you accountable. Drink plenty of water to stay hydrated. Also, when you are increasing your fiber intake, it is important to drink plenty of water to avoid constipation. Water is an important nutrient to help flush waste out of the body and keep the body functioning effectively. Meet with your healthcare provider on a regular basis to help control and treat your diabetes and keep track of any risk factors. In addition, your healthcare provider can provide support if you have any questions or concerns in regards to your overall health. Take supplements as needed such as vitamins for any deficiencies you may have as well as supplements such as Glucarex by Vita Sciences. Glucarex contains ingredients such as alpha lipoic acid and cinnamon that have been shown to support healthy blood glucose levels. Could Probiotics Improve Health Outcomes After Injury? Fermented foods can provide natural sources of good bacteria. From hearing your stomach grumble when it’s hungry to the gurgling sounds of indigestion, the gut reminds us everyday of its important presence in our health. Gut bacteria are vital to keeping balance in the body. Also, gut bacteria make sure that any food consumed is being used for energy. However, recent research has shown that gut bacteria may also be crucial for positive health outcomes after injury. Imbalances of gut bacteria in the body can lead to conditions such as inflammatory bowel disease (IBD). Also, gut bacteria live in harmony with the immune system and work together to keep the body safe from “bad” bacteria. However, an imbalance in “good” versus “bad” bacteria in the gut could have an impact on immune system function. A study of 12 critically injured adults in the journal Trauma Surgery & Acute Care Open looked at the status of gut bacteria health over time. Stool samples were taken 24 hours and 72 hours after admission to the hospital. After 72 hours, three types of bacteria had been depleted in the injured group, while two types of bacteria had risen. More studies need to be done to explore this finding more. However, the researchers suggest that gut bacteria structure could affect patient outcomes after traumatic injury. Furthermore, probiotics may be one future treatment to help improve patient outcomes in these cases. Biovia30 by VitaSciences provides 30 million colony forming units per dose of diverse strains to help restore balance in the gut and promote immune system strength. Furthermore, Biovia30 contains various strains of Bacillus, Lactobacillus, and Bifidobacterium to help you build up “good” bacteria stores and keep “bad” bacteria out. Eat plenty of fruits, vegetables, and other fiber-rich foods to help promote diversity of gut bacteria. Stop smoking or don’t start since smoking can negatively affect gut bacteria and the immune system. Not only does smoking constrict blood vessels, but it also causes inflammation in the body which can cause cell damage. Find healthy ways to manage stress such as yoga, meditation, or exercise since stress can alter gut bacteria populations. Stress is one of the contributing factors of IBS. Lower saturated fat intake to help lower numbers of inflammatory microbes in the gut. Consume phytonutrients such as polyphenols and tannins found in colorful berries, beans, nuts, seeds, and teas. These compounds can nourish microbes in the digestive tract. Probiotics shown great promise for helping to treat various health conditions. However, potential benefits of probiotics must be confirmed by further research. Please contact your healthcare provider before starting any new supplement regimen. Probiotics, or gut-loving bacteria, started to blossom back in the late 1800’s to early 1900’s as part of a healthy lifestyle. It was during this time that Scientist Elie Metchnikoff proposed that consumption of yogurt with Lactobacillus helped decrease the amount of toxin-producing bacteria in the gut and increased life years in hosts. The advent of probiotics has improved gut health for many. You may have heard about fermented foods, probiotics, and how good they are for you. However, do you really know what they are, and why they are so healthy? The conversion of carbohydrates in the foods to alcohol or organic acids produces fermented foods. This is done by using microorganisms such as yeast or bacteria under the absence of free oxygen. As a result, the fermentation process can lead to increased concentration of vitamins and nutrients in the final product. In addition, other benefits of fermented foods include enhanced flavor and increased digestibility. 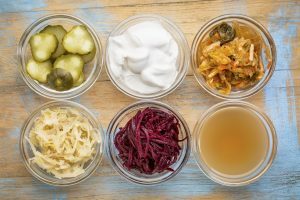 Finally, it is important to note that fermented foods are only probiotics if the bacteria culture survives long enough to provide benefits to the GI tract. These are some fermented foods that are considered probiotics. 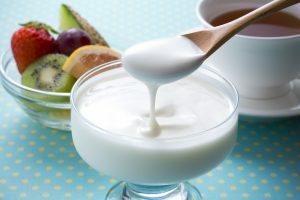 Yogurt, which is milk fermented with bacteria like Lactobacillus acidophilus. Kimchi, or spicy pickled cabbage, which is a popular dish in Korean culture. Sauerkraut, which is a pickled cabbage commonly eaten in German culture. Cheeses like Gouda, Cheddar, Swiss, and Parmesan. Not all cheeses have probiotic qualities, but in these particular cheeses the bacteria survives long enough to benefit the GI tract. Furthermore, during digestion beneficial bacteria is protected by the fat in cheese. There are also some fermented drinks that provide probiotic benefits. Cow’s milk fermented with bacteria creates the sour yogurt-like drink called kefir. Live cultures added to milk creates buttermilk. However, cooked buttermilk can deactivate these gut-beneficial cultures. Sweet tea fermented with yeast and bacteria creates Kombucha. With so many different probiotics on the market containing so many different bacterial cultures in so many different amounts, it can be difficult to know which will provide the most benefit. However, Vitasciences makes it easy for you when it comes to choosing the proper probiotic. BioVia30 contains a diversity of bacterial strains containing Lactobacillus and Bifidobacterium that helps to increase the good bacteria in your gut. Therefore, choose Vitasciences when shopping for your supplement needs. Cruz, A., et al. (2009 Aug) “Probiotic cheese: Health benefits, technological and stability aspects” Trends in Food Science & Technology, 20(8):344-354. Ganesan, B. et al. (2014) “Probiotic Bacteria Survive in Cheddar Cheese and modify populations of other Lactic Acid Bacteria.” Journal of Applied Microbiology, 116(6): 1642-56. Copyright © 2016 Vita Sciences / All rights reserved. These statements have not been evaluated by the Food and Drug Administration. This product is not intended to diagnose, treat, cure, or prevent any disease.